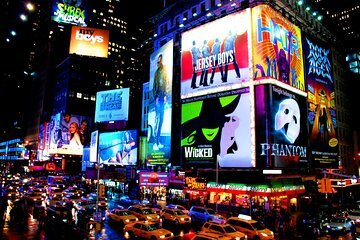 Dai un'occhiata da un insider a Broadway, il cuore dell'industria teatrale americana, in questo tour a piedi guidato di 2 ore. Scopri la storia e gli avvenimenti del famoso quartiere dei teatri di New York. Ascolta le storie sul dietro le quinte delle star di ieri e di oggi da una guida professionista. Visita famosi teatri di Broadway come il Majestic Theatre, sede del 'Phantom of the Opera' e molti altri. Inoltre, esplora il ristorante Sardi, il brindisi di Broadway per oltre 90 anni e la 45esima strada, sede di molte esibizioni di Broadway. We found our guide to be very knowledgeable of the history and annecdotal information regarding the various theaters in the Theater District. Another guide joined the group — apparently as part of a training exercise. Her presence was distracting, however, since the guide was more interested in talking to her and singing show tunes, than paying attention to the clients. She added nothing to the tour. Sean was the best tour guide ever! He was very knowledgeable and made the tour very enjoyable! We had a awesome time! Everyone needs to do this tour! Patrick did a super job. Very fun, knowledgable and interesting we learned a lot about the history as well as the present happenings in the theatre district. We enjoyed this tour very much...a fun experience. This was a very interesting tour of the history behind the theatre district. It was very entertaining and informative.